Some people said that the third book was their favorite, so going into the fourth book, I was a little worried I wouldn't like it as much as the third. I don't know what I was worried about!!! I really enjoyed this fourth book, maybe even more than the third to be honest. You will notice new characters in this book, but I noticed that I liked them almost immediately, and because we have so much information now their stories incorporated easily. You will also notice some missing characters in this book.... where's Tyrion or Dany? They are in the next book as the author tells you at the end. These books are long and the characters are complicated, but the author wanted to tell complete stories, as he says, so he split the book in two; that is why some of the characters are "missing." I loved seeing the perspective of Cersei...that was a great addition to this book. I also really enjoyed how the names changed for some of the characters. Like how Arya became Cat of Canals or Sansa became Alayane. It felt like the characters and the book were getting really deep and I enjoyed that aspect of it. Oh and the return of Caitlyn Stark is chilling...as is Biter. Holy hell that guy is terrifying. And who among us didn't enjoy Brienne of Tarth's story. She really is a great hero. Oh and let's not forget Tommen's new wife... it's all a great story building and building up to the fifth book, which I now can't wait to read. This series just delivers on so many levels. I feel like I really sink my teeth into it, and it takes me so many places. 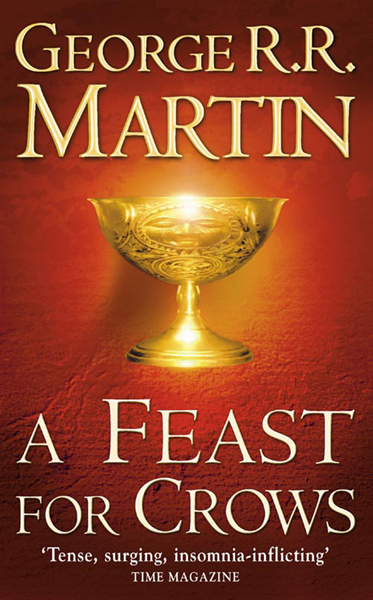 I DID miss Tyrion in this book but since I know I will see him next time, I am not so worried. 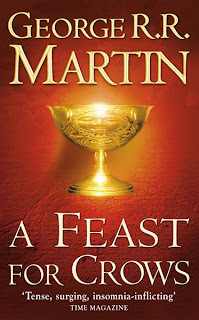 I have to say that there is a lot of genius in the intricacies of the series, and I think that from the four books I have read so far, this is one of those series you could really read again and again. Fifth book: A Dance With Dragons is going to be a great read!!!!!!! !